Martin Scorsese's Masterpiece of Hard-hitting Realism.. 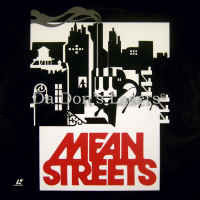 Mean Streets 1973 - 110 min. - Color Genre: Drama LaserDisc Movie Storyline: Martin Scorsese's electrifying drama tells the story of Charlie (Harvey Keitel), a charming 27-year-old who is supported by his devoutly Catholic mother. He spends his days wandering the streets of New York City and nights hanging out drinking with his good friend Johnny Boy (the terrifyingly brilliant Robert De Niro), a loose cannon that can't seem to escape trouble. Charlie's extreme affability makes him the middle man between his mob-tied uncle Giovanni (Cesare Danova) and various clients, as well as between Johnny Boy and Michael (Richard Romanus), a bookie who has become fed up with Johnny Boy's constant debt dodging. As the city's San Gennaro Festival takes over the streets of Little Italy, Michael seeks revenge on Johnny Boy once and for all. MEAN STREETS is the film in which Scorsese blossomed into one of the world's most ferociously distinct visionaries, a vision which has, for better or worse, become one of the most mimicked in the history of modern cinema. While his usage of a nostalgic pop music soundtrack, long one-takes and handheld cameras, and brutally realistic performances, spawned a generation of imitators, MEAN STREETS proves that while others may try to imitate, there is only one original. MEAN STREETS is a work of sheer cinematic bravado. 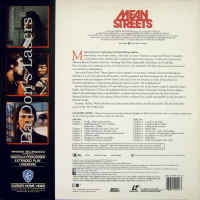 LaserDisc Movie Review: "You don't make up for your sins in church; you do it in the streets; you do it at home. The rest is bulls t, and you know it." Returning to the autobiographical milieu of his 1968 debut Who's That Knocking at My Door for his third feature, Martin Scorsese examined the daily struggles of a wannabe hood to keep his morals straight on the streets of Little Italy. Driven equally by his wish to become a respectable gangster like his uncle (Cesare Danova) and his desire to live his life like St. Francis, Charlie (Harvey Keitel) takes on his energetically unhinged friend Johnny Boy (Robert De Niro) as his own personal penance, intervening to get Johnny Boy to pay off a debt to the local loan shark Michael (Richard Romanus). Despite his promises to his epileptic girlfriend Teresa (Amy Robinson) that they will move out of Little Italy once he strengthens his position in his uncle's world, Charlie's involvement with Johnny Boy further ensnares him in the neighborhood. When Johnny Boy decides to mouth off to Michael rather than pay him, Charlie, Johnny Boy, and Teresa try to flee Michael's murderous anger (and an assassin played by Scorsese), forcing Charlie to realize that the rules of the streets do not mesh with absolution. Whereas fellow "film school generation" director Francis Ford Coppola transformed the Hollywood gangster movie into metaphorical epics about the Mafia and capitalism in The Godfather (1972) and The Godfather Part II (1974), Scorsese revised the genre in the opposite direction, focusing on the gritty minutiae of daily life and drawing from personal memory. Combining documentary-style realism (even though most of the film was shot in L.A.); kinetic editing and camera movement; and expressionistic lighting, angles, and film speed, Scorsese presents an intimate picture of the trivial incidents and latent violence of Charlie's and Johnny Boy's world, naturalistically unfolding their experiences rather than simply explaining what motivates them. They lead a claustrophobic, petty existence that Scorsese and screenwriter Mardik Martin witnessed growing up in Little Italy, complete with a soundtrack of hit songs like "Be My Baby" and "Jumping Jack Flash" that had poured out of neighborhood radios. Mean Streets opened at the New York Film Festival to excellent notices and played strongly in New York but failed to duplicate that level of business elsewhere. Even so, Mean Streets established Scorsese and De Niro as formidable young talents and marked the beginning of a long-running and fertile collaboration that continued in such films as Taxi Driver (1976), Raging Bull (1980), The King of Comedy (1983), and Goodfellas (1990). Scorsese's exceptional grasp of the texture of day-to-day life, the rhythm and cadences of street talk, and cinema's visual and aural possibilities makes Mean Streets one of the pivotal films of the 1970s, as well as of Scorsese's career, and an influence on such future filmmakers as Spike Lee and Quentin Tarantino, among many others. 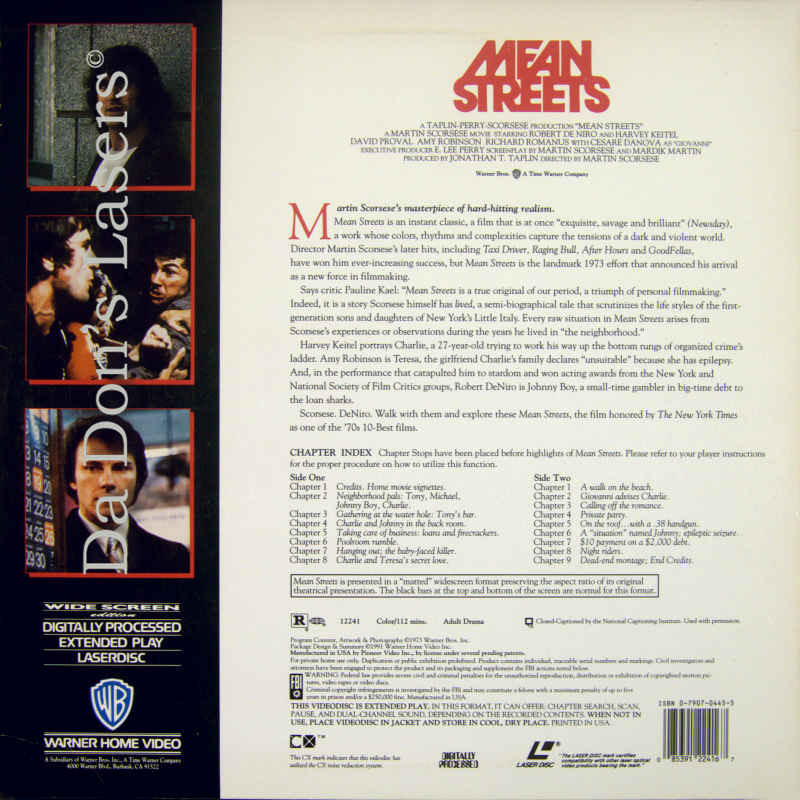 --- Lucia Bozzola Mean Streets was not Martin Scorsese's first film, but it was the first one that really mattered, an alternately troubling and exhilarating look at one man's obsessions and at a subculture that other movies rarely examine beneath the surface. Scorsese's fascination with sin, redemption, guilt, and crime first bore real fruit in Mean Streets, and in many ways Charlie (Harvey Keitel) is the ultimate Scorsese character: a sincere Catholic who, as a low-level gangster, has chosen to live outside the laws of God and Man, and who tries to find a penance and personal moral code that will mean something to him. Charlie's inner turmoil underscores the film's every movement, as his Thanks for Visiting DaDon's Rare LaserDiscs ! Reviews, Articles, Newsletter and Information for Movies on LaserDisc LD Laser Disc, LazerDisc.